Gamespot has a good interview with the Guild Wars Live Team’s Linsey Murdock. While the updates have been rolling in for awhile now, the interview helps to re-focus what is actually going on. And, what is actually going on? A new campaign has started titled ‘Guild Wars Beyond.’ This campaign will start to wrap up, and also advance, much of the lore of the original Guild Wars to set the stage for Guild Wars 2 with ongoing updates throughout the year. It starts, obviously, by looking at the human side of things because in Guild Wars 2 the human nation is Kryta and the human hero is Logan Thackeray. This first chapter gives some good answers as to how we get there about 250 years later. It is important to note that anybody that wants to wait, for whatever silly reason, should be able to experience all these additions as well when they chose to join in. In other words, these additions are not merely temporary stemming from some passing event. As was expected, additional costumes reflecting the conflict in Kryta have gone on sale. Players can choose to either dress up in the rebellion’s Shining Blade garb or ‘disguise’ themselves in White Mantle apparel. 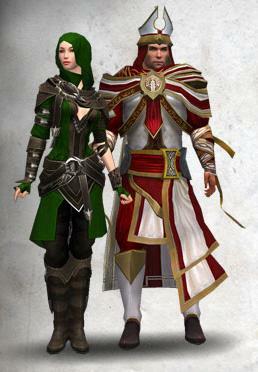 The costumes, like the preceding Wintersday ones, are $7 each or for a limited time $10 for the pair. They are definitely not as dressy as the Wintersday costumes, but they are a little more workable. Prêt-à-porter. The initial dyings are okay, even if the Shining Blade one looks a little lumberjackish, but they really shine when they are dyed different colors. Players also seem to really like using just the Shining Blade hood to give non-Dervish characters that Altaïr look. Honestly, this is what Guild Wars has needed ever since we learned that Guild Wars 2 was not going to be played, in any form, in 2008. ArenaNet really needed to come back to creating an ongoing story that gives players something to look forward to as they play. Guild Wars players were kind of left hanging with “there might never be more content.” This is not to belittle the Guild Wars Live Team, prior to its current state, that has created some fantastic additions with very few resources. But, now it seems ArenaNet is loosening the grip on other resources like art and writing to revisit their first game, and expanding the Live Team a bit more (job postings are for GW2). I am excited to see what other scenarios ArenaNet has planned. My [unrealistic?] hope is that we might be able to experience somehow one of the Elder Dragons actually awakening. Also, now that we are on another campaign, please lord have mercy, change the title screen. After, I think, three years of looking at it, I would prefer a Matrix loading construct instead. Now back to bringing peace to Kryta… by killing Peacekeepers. All cheers to the story additions. I am going to take a look outside Bergen tonight. The shop costumes deserve their own thread/article. If you want to give the article a different flavor than the usual pro or contra rants, you could also compare them to the Blizzard pony and non-sub games vs sub games with fluff item shops. I plan on it. Maybe this afternoon. I have a good thought that I haven’t seen mentioned yet. It is not a Campaign in the sense of a new chapter, it is an ongoing thing. The job specs are for Guild Wars 2, not the Live Team.